One croc got a little too close for comfort, however. On Thursday, January 21, a Florida Keys homeowner was greeted by an uninvited guest lounging in his pool. Seems like the ocean isn’t good enough for our scaly friends these days! 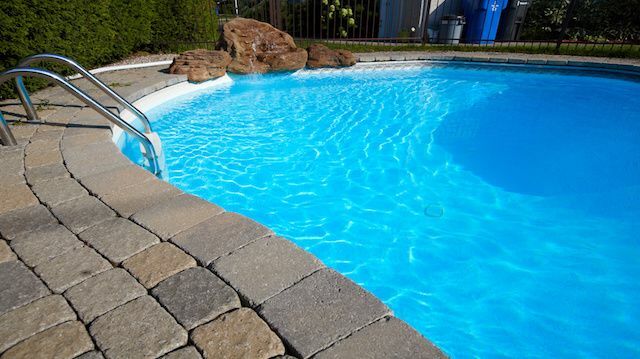 We all know that pools are often temporary homes to frogs, snakes and other small aquatic creatures. Critters mistake the man-made swimming hole for their own, nice, algae-filled lakes or swamps. These frequent, but insignificant pool guests are given a cool glass of lemonade and sent on their way with little fuss. But what would you do if you found something bigger swimming laps in your tropical oasis? The unfortunate owner of this Florida Keys home had to answer that question in a hurry when he came home to find a crocodile had taken up residence in the backyard. The proper authorities were notified, and thankfully the eight-foot crocodile was safely returned to the ocean. Probably one of the most unexpected animals to find trapped in your pool! One can only imagine the puzzlement homeowner Cris Nonnemaker must have felt when he discovered holes in the cover of his off-season pool. Not to mention the panicked movement coming from beneath the cover. Armed with a video camera and some backup, Cris discovered what exactly was causing the ruckus. He certainly did not expect to find a perturbed buffalo reveal its head from under the cover. A valiant rescue was made, and the buffalo was returned to the local farm from which it had absconded a week prior. Who knows what other mischief the escapee had gotten into before his taste of freedom came to an end. Deer have been known to get into all sorts of unusual situations. In 2009, a North Carolina apartment complex pool was crashed by a runaway deer. Literally. The panicked deer crashed through the ceiling of an indoor pool. Security cameras caught the unexpected swimmer on film. The deer swam laps for about 15 minutes before apartment managers spotted the distressed animal on the security camera screens. Maintenance was called, and the deer was safely herded towards the shallow end of the pool where it climbed right up the stairs and ran out of the building unharmed. This rescue attempt required a little more heavy machinery. The cow, dubbed Daisy by rescuers, came from a nearby farm and stumbled into a backyard pool. Daisy was believed to have been in the pool for a number of hours before being discovered. Much effort was invested in the recovery of the wayward cow. An animal rescue team, two fire crews, and one hydraulic vehicle were required to finally get her out. The heifer wasn’t exactly cooperative with her rescuers, either. She eventually had to be sedated and pulled out of the pool in a harness. Daisy was returned to her herd no worse for wear, and she had quite a story to tell her four-legged friends around a pile of hay. Perhaps one of the most unusual and shocking pool incidents involved some four-hoofed friends. Two horses were found in 2010 in a swimming pool in Ohio. This time, it wasn’t the animal that was odd, but rather the manner in which the horses arrived in said pool. The two horses, Libbey and Murphy, had been swept up in a tornado, plucked right from their green pasture during a storm. They even survived multiple crashes to the ground, only to be deposited in a neighboring swimming pool. The horses were eventually rescued with minor injuries. What a day! Have you ever had any uninvited pool guests? What did you do to get them out? Or did you just enjoy a swim with them? We’d love to hear your animal-pool stories. Hey Buddy!, I found this information for you: "Animals in Swimming Pools: 5 Weird Stories". Here is the website link: https://www.thealternativedaily.com/animals-in-swimming-pools/. Thank you.